It's funny - I heard that there was a lost island in the Caribbean, but I had never heard of one in the Arabian Gulf. 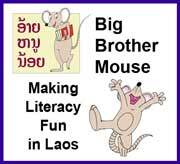 Fortunately, not only was it found for us, but a large tourist resort was built around it. Just to be sure, they added a theme park, monorail, 17 restaurants, and a parking lot the size of Ohio to get everyone's cars added to the Atlantis GDP. 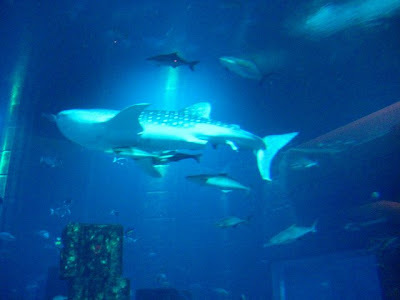 Of note, the intelligentsia at Atlantis decided to "rescue" a juvenile whale shark off the coast of Dubai two weeks ago, and it's here in the aquarium. Apparently, the water temp and salinity of the gulf were too much, and the biologists decided it was better off in a tank. I'm not sure that was the best call, but then again, I'd like to see you stand up to a 12 foot, 3 ton fish interested in the round-the-clock feeding. Katie, could you pass the Grey Poupon? 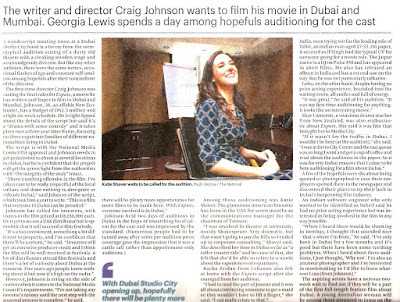 We have a new starlet in the house - at least according to the National, the UAE's daily newspaper. 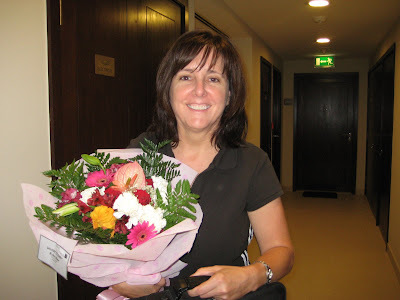 A couple of weeks ago, Katie auditioned for a part in an Indie movire called "Expats", a view into the expatriate world of Dubai. 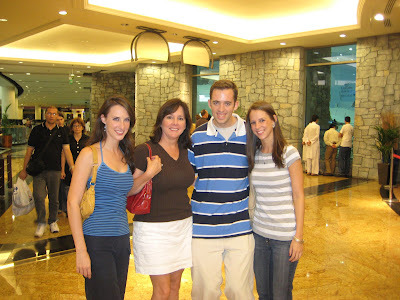 Nevermind the shear relevance of Katie playing an expat in Dubai - this a movie that exposes all of the issues of Western families that deal with the personal and professional world of the Arabian peninsula. Never Too Old for Mommy! This one's for everyone who still thinks that global warming is a myth, and that we aren't causing any of it. Who am I kidding? They can't read, let alone do a google search "Al Gore". If you look closely, you'll not only see three glaciers receding and spilling into what is now a melting river. You'll also see how much water those glaciers actually hold. That glacier on the left is over 4000 ft high - you see the cliff at the edge breaking off right in front of us. This caught my interest because of something that I caught in the 5 minutes of an Inconvenient Truth that I've watched. 30 Years ago, everything blue in the top picture was a mile-deep sheet of ice, and you wouldn't even know there were mountains there. An ice cube on your counter will melt in 5 minutes or so. 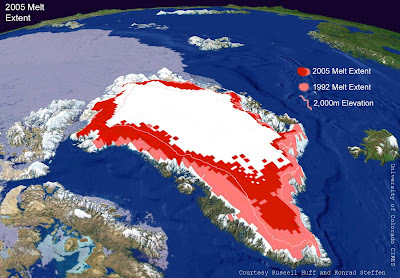 Apparently, at the rate we're going, an ice cube a mile deep and two miles wide doesn't take much longer.So, to everyone out there who thinks that this problem will take forever to materialize, and "how can so much fresh water melt and raise the oceans? ", we're all completely wrong. 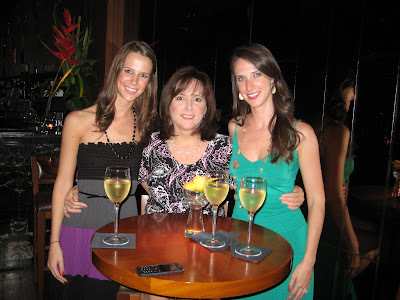 Lisa and I went to beautiful Sohour event for my company last night. Sohour is the late night meal that is eaten before the next early morning prayer time. It was held in an air conditioned tent at the Grand Hyatt hotel and it was complete with the obligatory Arab food: hummus, dates, lamb kebab, etc. They also had an extensive shisha menu (Lisa and I had the mint flavor), and a full tea service. The only regret that is that we forgot to bring out camera! 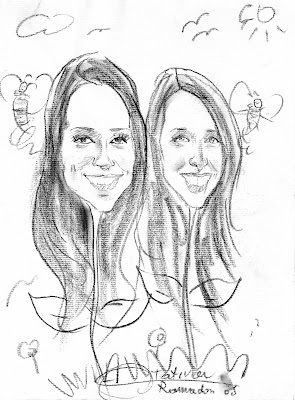 Good thing that there was a caricaturist roaming around, so we asked him to capture the moment. What do you think? Does it look like us? I thought that living in New York City would prepare me for exactly how bold I would need to be to get around Dubai. However, it looks like the NYC experience didn't even scratch the surface and I find myself needed to be more bold and aggressive in order to get things done in this town. Today, I found myself in a particularly precarious situation and I think it might be time for me to dial it back. It all started when I was running late for one of my meetings. The area I work in, Garhoud, is notorious for it horrific parking situation. Every morning I battle to find a space and when you do find a space everyone parks one another in. The only remedy to this problem is that people leave their business cards on the windshield and you are expected to call them if you need them to move their car. Today, I was able to find a spot but to my dismay, when I went to retrieve my car, there was a car parking me in but, the car was still running with no driver to be found. I walked around the car and peered in the tinted windows but couldn't see anything. After two minutes of waiting and the frustration of being late for my meeting growing, I decided I needed to take action. I jumped in the driver's seat to reverse the car enough so that I could have room to pull out. As I the throw the car into reverse and look over my shoulder… I scream. 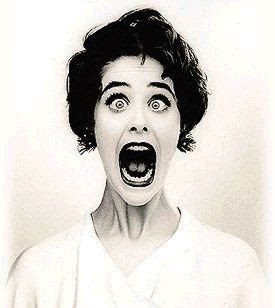 Not just any scream...it was the kind of scream that you hear in a horror movie. There was unsuspecting Pakistani man sitting in the backseat. I tried to explain to him, through my laughter and shock, that I was simply trying to the move the car a few feet because he was blocking my car. I think there was some time of language barrier because this poor Pakistani man didn't seem to be startled in the least. By the time this ordeal was over, someone had pulled up behind the car and I was unable to reverse. I figured I was this deep and desperate times call for desperate measures so, I pulled the car into the only other available space, a construction site. After putting the car in park, I apologized profusely and jumped out and ran laughing to my car. "Is the building moving, or is my fasting causing me to hallucinate?" That was the question that my colleague asked, when he burst into our conference room. At first we suspected that it was indeed the fasting because we hadn't felt a thing. 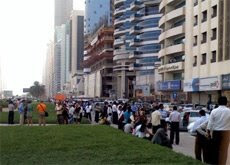 That is until we realized that the rest of our company on the 31st floor of our building had evacuated, as did all the skyscrapers and office buildings on Sheikh Zayed Road. 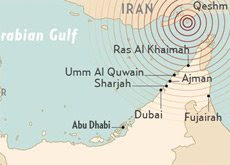 Apparently we had just felt a diminished version of the 6.1 earthquake that just hit Iran. 50 miles away it had leveled 200 villages in Iran, but lucky for us we just got a few jolts. As you might imagine, as one of the few cities in the Middle East that actually has sky scrapers, and as a neighbor to Iran, most news coverage immediately convened on Dubai to make sure all the buildings were still standing. Poor Iran, they get the quake and we take all the credit! I think everyone turned a wary eye towards the still growing Burj Dubai tower and thought "you guys planned for this right"? Right? Ramadan Kareem! Our First Iftar Dinner. So it’s Ramadan in Dubai, which means for the better part of the day we are either starving or thirsty, or both. However, the lively nights during Ramadan more than make up for the parched days. On Saturday we were so excited to be invited to our first Iftar event. Iftar, is the name of the meal that happens just as the sun sets to break the fast, and it is a huge lavish communal event, where families and neighbors and even strangers will sit together around big tables or on carpets and leisurely chat to one another. 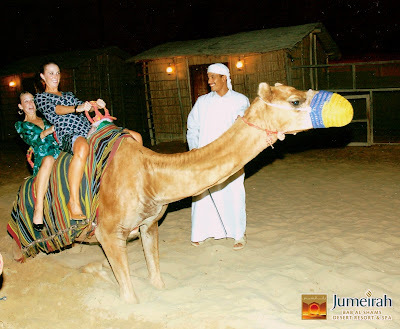 For our Iftar we were invited to the Bab al Shams Desert Resort which is known as the preeminent local retreat in the area, so we knew that we were in for something special! After an hour’s drive into the desert we were greeted with a huge lit up ‘Ramadan Kareem’ sign on the hill. 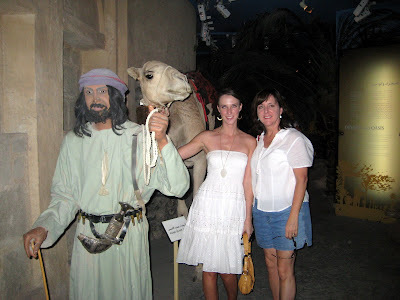 We followed the winding path of carpets set on the sand and were let to a veritable Arab wonderland of delicious food, entertainment and yes, even camels! We broke the fast with the traditional warm bread, dates and yogurt milk, and then went on to sample the smorgasbord of food that was laid out – grilled meats, soups, rice, falafel, kebab, seafood, you name it. It was a bit of Russian Roulette to figure out what we should dish on the plate, so we tossed our apprehension aside and tried nearly everything (whether we knew what it was or not)! After gorging ourselves (hey, it’s expected) we rolled ourselves over to the camels and took a ride. I tried to prepare Lisa and Matt for the unexpected 3 foot ascension and drop you experience when you’re on the back of one of these beauties but that didn’t stop her from shrieking her head off! Please draw your attention to the facial expression in the photo below. Just in case, you can't see Lisa's face, let me provide you with a larger copy here. 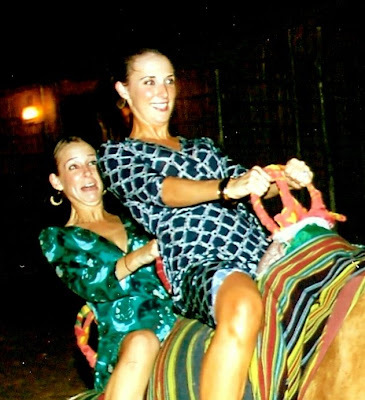 Of course, if we knew camel rides were an option we wouldn't have worn dresses and high heels! After that we moved on to more tame things like stroking a baby goat and a falcon! It was a great experience and certainly showed us why Ramadan is one of the most festive times of the year! It’s a Bird, it’s a Plane, it’s Super Matt! They may not be Olympic trained athletes, but last Saturday at the “Kas Tatweer” the competition was fierce! “Kas Tatweer” which means the Tatweer Cup, is the annual athletic competition between the employees of the many different entities in our company – Tatweer. Naturally, given the 111 degree weather, the competitions were held inside at a local private high school. Matt was only slated to play on his company’s soccer team, but was quickly drafted upon arrival to join the volleyball competition, as well. It seems that despite his grumbling Matt was made to play the game, those extra long arms and legs really came in handy and before I knew it he was a one man show: digging, setting, blocking and spiking at the net…I’d never seen this before! The crowd was loving it, and was going berserk every time Matt owned someone at the net! This set the stage for the soccer competition which quickly got off to a good start with a near miss shot on goal by Matt. The ball bounced back to him and when he hooked it back with his foot towards the goal, he managed to miss the goal but score a perfect bank shot on the basketball net overhead, the crowd just went wild! After hooking a few more in the goal with that tricky left foot, the game was won! People were rushing up to Matt high-fiving, cheering his name, patting him on the back. Who knew I was with the Tatweer David Beckham? It was time for the final sport, and we wondered if Matt could continue his winning steak through the next competition, we looked to the board and saw that next up was….basketball. We decided that it was indeed, time to go home!